One of the most frustrating causes of weld failure is magnetic arc blow. 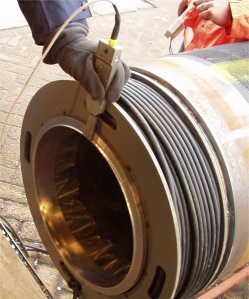 A magnetic field present in the weld preparation region of mating steel components can cause the type of weld problem that could never pass inspection. Magnetic arc blow is not an uncommon problem if the entire welding industry is considered, but it is rare enough for individual fabricators to operate for years without any serious difficulties and then be caught by surprise when it does occur. All welding processes that use either an arc or a beam of electrons are subject to disruption in a magnetic field. This is caused by the electrons being forced to follow a curved path when they pass through the magnetic field, deflecting the arc and causing it to behave erratically. Some welding processes are more sensitive to arc blow than others. The effects of arc blow can be reduced by welding at higher currents which produces a stiffer arc. Welding carried out in hyperbaric conditions is more prone to arc blow because the electrons in the arc are slowed down and scattered by the extra gas molecules in the high pressure atmosphere, allowing them to turn more in the magnetic field. TIG welding tends to be more sensitive than MIG or MMA because of the lower arc voltages used. Additional difficulty is sometimes found when two or more welding heads are used at the same time on the same joint because the magnetic field produced by the weld current at one head can interfere with the arc at another head. The following table lists the most common effects of magnetism on welding processes. The table shows how welding arcs can be expected to behave in increasing magnetic field levels. Problems begin from 10 – 40 gauss, yet when even weakly magnetic fields are present in parent material the value in the joint preparation can easily be several hundred gauss and fields over 1000 gauss are not unusual – at these levels a specialist tool such as the Zeromag ZM100A is required.